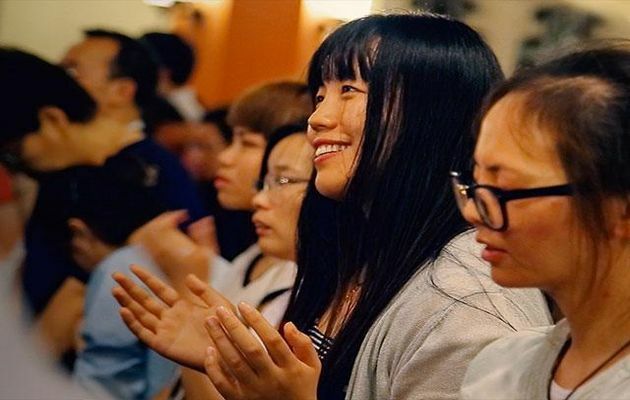 Chinese Millennials look to the church for answers to life's big questions. 62% of China's believers are between the ages of 19 and 39. 62% of China's religious believers are between the ages of 19 and 39. China's big cities like Shanghai are filled with Millennials. Twenty-four million people live in Shanghai and three-fourths of them are between the ages of 20 and 33. Chinese young people say they're moving to Shanghai for several reasons. "I moved to Shanghai a few years ago. My friends kept on telling me I could find better jobs here. I want to earn more money for my family", Zhao Giang, a young Shanghai resident, explained. Besides looking for jobs, China's next generation appears to be turning toward Christianity, with many Millennials looking to the Church for answers to life's big questions. One study from the Chinese Education Department found that 62% of China's religious believers are between the ages of 19 and 39. "One day, my friend invited me to church after work. It was new to me. As I listened to the music, all of a sudden, I felt so peaceful. I felt something special", Li Gang, a young believer, said. Christian leaders in Shanghai say young people are attending churches because they long for places where they can "take a break" and "express themselves openly." "Living in the big city is not easy for them. Many of the young people share with me they face burdens all the time. Some of them just cried to me and asked me to help them", faith leader Kate Gu said. Church leaders use biblical truths to help Millennials cope with life. They share their own experiences and tell them about God's grace. "For the single people, I understand their concerns. I read the (biblical) story of Ruth and explained the meaning to them. I want to make sure they understood I had the same struggle before. But God is faithful," Gu said. With the leaders' help, some young Chinese attend church services regularly. They learn to pray for themselves and their families, and they no longer feel empty inside. "Now, I am a Christian. I am not afraid of anything. Jesus is always with me. I am not alone when I face difficulties. I won't see church as a building, it means a family to me", one Chinese youth testified. Today, Shanghai remains one of the most important cities in China. Many churches are planning more events to reach younger generations. They believe these young people could help bring the city's residents closer to God. "We want to use all the resources to build the bridge between young people and our Savior. They could do some amazing work for Jesus", Gu affirmed. Although China is officially an “atheist country”, many experts believe that, on current trends, there will be 250 million Christians by around 2030, making China’s Christian population the largest in the world. Besides, China is also the biggest producer of Bibles worldwide. The expansion of Christianity concerns Chinese politicians, who continue to pressure on Christians, demolishing church buildings, taking down crosses, and harassing lawyers who defend non-official churches. Despite all this, the first Mission China 2030 Conference has been held in Hong Kong last year, with the of sending out 20,000 native missionaries by the year 2030.Next year, the Conference will take place in Beijing.